There are two main types of synaptic connections in the mammalian brain: excitatory glutamatergic synapses and inhibitory GABAergic synapses. The balance between excitatory and inhibitory inputs a neuron receives regulates the overall activity of neuronal networks; disruptions to this balance can cause epilepsy. A new paper in J. Neuroscience from the Paradis lab shows that treatment of cultured neurons with the extracellular domain of the protein Sema4D causes a rapid increase (i.e. within 30 minutes) in the density of functional GABAergic synapses. Further, addition of Sema4D to neurons drives GABAergic synapse formation through a previously unappreciated mechanism: the splitting of pre-existing assemblies of the Gephyrin scaffolding protein. To our knowledge this is the fastest demonstration of synapse formation reported thus far and has significant implications for our understanding of the mechanisms of GABAergic synapse formation. While the underlying mechanism of epileptogenesis is largely unknown, recurrent seizures emerge when there is an increase in network activity. One possible therapeutic treatment would be to restore normal network activity by increasing network inhibition. 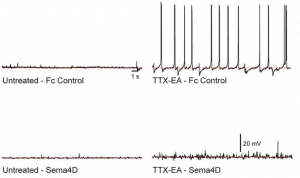 In an in vitro model of epilepsy, acute treatment with the protein Sema4D rapidly silences neuronal hyperexcitability, suggesting a possible use of Sema4D as a disease-modifying treatment for epilepsy. Lead authors on the paper were Marissa Kuzirian, a grad student in the Neuroscience Ph.D. program, and Anna Moore, a Brandeis Neuroscience postdoctoral fellow. Marissa Kuzirian and Amy Ghiretti, graduate students in the lab of Dr. Suzanne Paradis, were each recently awarded Ruth L. Kirschstein National Research Service Awards for Individual Predoctoral Fellows (F31s) from the National Institutes of Health. Marissa’s 2.5-year award from the National Institute of Neurological Disorders and Stroke funds research to explore the role of Semaphorin4D and its receptor, PlexinB1, in regulating inhibitory synapse development and ultimately setting up proper neural connections in the mammalian CNS. Amy’s 2-year award from the National Institute on Drug Abuse funds a collaborative project between the Paradis, Lau, and Van Hooser labs here at Brandeis to elucidate the function of Rem2 in mediating experience-dependent changes in dendritic morphology in a living, intact animal system. The basis for Marissa and Amy’s work comes from research into neurodevelopmental disorders such as Autism Spectrum Disorders (ASDs), as well as drug abuse and addiction. Proteins that regulate neurodevelopmental processes such as synapse development and dendritic morphology are important in both neurological disorders and drug addiction. Proper communication between neurons depends on the precise assembly and development of synaptic connections. The transmembrane protein Semaphorin4D (Sema4D) is necessary for proper GABAergic synapse formation, as knockdown of expression in the postsynaptic neuron by RNAi leads to a decrease in GABAergic synaptic density in cultured neurons (Paradis et al 2007). Marissa’s work will further explore this role of Sema4D in GABAergic synapse development. 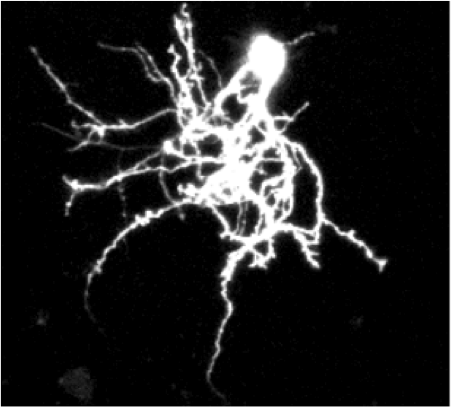 Inhibitory synapses are identified in white along dendrites of a rat hippocampal neuron. Synapses are defined as sites of overlap between the postsynaptic protein GABAA receptor subunit γ2 (red) and the presynaptic protein GAD65 (blue) visualized by immunostaining. 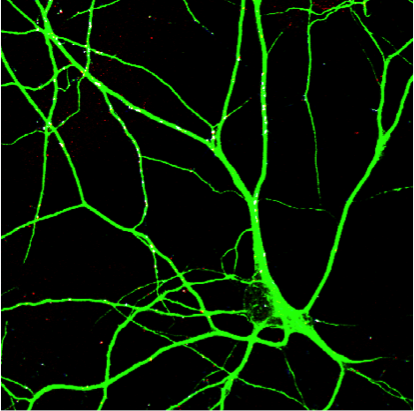 Neurons are visualized by immunostaining for MAP2 (green). Marissa’s preliminary results demonstrate that adding the soluble, extracellular domain of Sema4D to cultured hippocampal neurons is sufficient to drive GABAergic synapse formation. This increase depends on the expression of Sema4D’s receptor, PlexinB1. Thus, Marissa’s work defines PlexinB1 as a novel receptor mediating GABAergic synapse formation in response to Sema4D in the mammalian CNS. The goal of Marissa’s project is to elucidate the role of Sema4D and its receptor, PlexinB1, in GABAergic synapse development. In experiments she proposed, she hypothesizes that Sema4D acts to initiate assembly of GABAergic synaptic proteins such as GABAA receptors and gephyrin through its receptor PlexinB1. This will be tested using a variety of imaging techniques in cultured hippocampal neurons, including confocal and time-lapse imaging, to measure the mobility and accumulation of GABAergic synaptic proteins in neurons after treatment with soluble Sema4D. The experiments will not only greatly expand our understanding of a novel receptor-ligand pair in GABAergic synapse development, it will inform as to some of the basic mechanisms underlying GABAergic synaptogenesis. Molecular mechanisms, such as the Sema4D-PlexB1 interaction described above, are critical for the ability of the central nervous system (CNS) to respond to extracellular stimuli and make corresponding changes in the structure and function of a neuron. 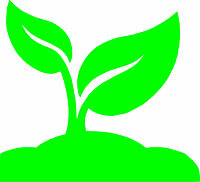 At the behavioral level, this plasticity allows an organism to respond to a changing environment appropriately in order to survive. At the level of individual neurons, this is reflected in changes in gene expression that occur in response to a variety of stimuli, including alterations in neuronal network activity. The goal of Amy’s work is to characterize a direct molecular link between changes in neuronal activity and changes in dendritic morphology. A neuron in the optic tectum of a Xenopus tadpole; Green Fluorescent Protein expression allows the dendrites to be visualized. Amy has previously implicated the protein Rem2, a type of signaling molecule known as a GTPase, as a mediator of such neurodevelopmental processes as excitatory synapse formation and dendritic morphology (Ghiretti & Paradis 2011). 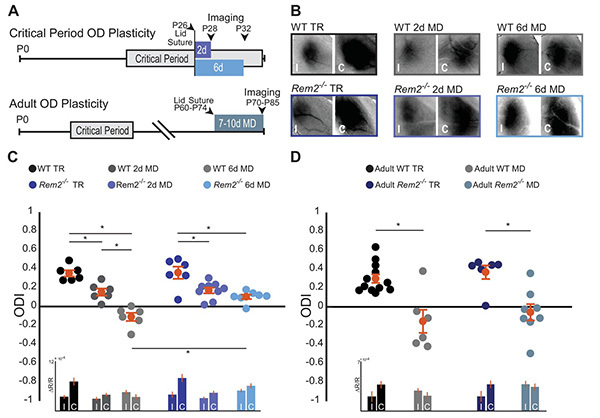 The expression of Rem2 in individual neurons is upregulated following increased neuronal activity, suggesting that it may serve as a direct link between changes in activity and corresponding changes in the structure and function of neurons. Her recently funded work will utilize Xenopus laevis tadpoles to study the effects of visual experience (by exposing the tadpoles to a light stimulus) on Rem2 expression, and in turn, how Rem2 mediates experience-dependent changes in the morphology of neurons in a region of the brain known as the optic tectum, where visual processing takes place. Ultimately, a full understanding of how Rem2 functions to shape the morphology of neurons in an intact system may help to inform knowledge of how the human brain changes as a result of neurological disorders or drug abuse, and aid in the development of more effective treatments to prevent these changes from occurring. While at Brandeis, Wolman, a Bio/Neuro double major, did undergraduate research in the Paradis lab. His thesis on “Involvement of USP12 and USP46 ubiquitin proteases in synaptic glutamate receptor accumulation” earned him high honors in Neuroscience. Wolman is currently a medical student at Tufts University School of Medicine.